I shall begin by describing benefits that I have received from yoga so that you can see how it could also help you. It is no exaggeration to say that yoga has completely transformed my life. As a result of my yoga practice, I am now much healthier. There used to be a time when I succumbed to a bad bout of flu every winter. Now I fall ill so rarely that I have almost forgotten what it feels like to be unwell! I also used to suffer from regular attacks of crippling back pain. This back trouble has now disappeared, along with all the constant minor niggles and aches that kept cropping up in different muscles and joints. My energy levels are up and I feel much younger. So much, that when I recently attended a yoga class with my daughter someone asked me if she was my sister! Enjoying good health and feeling younger is just one of the many benefits I have received from yoga. Because it works deeply at all levels (physical, mental, emotional and spiritual), yoga has also made me emotionally stronger and more resilient: I am now much better equipped and trained to face life’s challenges. The practice of meditation, which lies at the heart of yoga, is helping to make my mind clearer, calmer and more focused. Above all, yoga is bringing me ever closer to my soul. It is showing me how I can find contentment and be at peace despite being exposed to the usual stresses and pressures of modern city life. I teach because I am passionate about sharing the benefits of yoga. And I want you to feel great at the end of each and every yoga session! I personally enjoy the challenge of different asanas and sequences. One of my key strengths is the ability to break down complex postures into simple “baby steps”, so that within a short time you will be able to perform moves that at first sight appeared to be completely out of your reach! Having spent over 23 years working in a highly competitive corporate environment, I truly understand the stresses of modern living. I therefore incorporate specific relaxation techniques to help you unwind, slow down your busy mind and give your body an opportunity to re-charge. Chi Kri teaches us that there is more to yoga than just physical postures. Another area I am also very interested in is the practical application of yoga philosophy into our daily lives. Chi Kri encourages us to use the time we spend on our yoga mat to develop into Spiritual Warriors: equipping ourselves with the strength, knowledge and skills to be able to cope with life. For example, we learn how to perform asanas with courage, determination and strength, as well as with patience, love and compassion: qualities that would serve us well as we approach life and its challenges! In our private sessions we will employ a structured approach to address the areas that you wish to develop the most: flexibility, stamina, strength, relaxation, breathing, stress management, spine and back, meditation, spirituality, yoga philosophy or any other aspects of your health and well-being. Together we will draw up a suitable plan based on your objectives - I shall then tailor each session to ensure that you feel fantastic immediately after it and are also making tangible progress towards your goals. In the last few minutes I will provide suggestions for the regular personal practice that I encourage you to carry out between our sessions. Depending on your preferences, these will consist of 15-30 minutes of daily yoga practice and will include a few minutes of meditation, which lies at the very heart of yoga. For several years I had a strong and growing urge to share the benefits of the wonderful gift of yoga with all of you. My wife, Miti, and I took the opportunity to train as yoga teachers under our first teacher, Ellen Lee. We commenced teaching upon qualifying in spring 2009. Back then I continued with my full-time work as a freelance consultant in I.T. and taught yoga at the week-ends. However, something was shifting deep inside me: I found myself feeling most alive, most full of joy while teaching those week-end yoga classes. It dawned upon me that this was my calling, my “dharma”, my purpose in life. So in 2012 I followed my heart and took the plunge: to teach yoga full-time, I left behind my long and successful career of over 23 years in I.T. This is my third “career”: prior to I.T., I conducted research in Laser Spectroscopy, for which I have been awarded a PhD in Physics from Imperial College, London. They say that when you make a commitment that the universe approves of, assistance will appear in different guises to help you on your journey. Well, guess what: within a few weeks of my decision to quit I.T., Neil announced that he was going to be running the Chi Kri Gold Standard Teacher Training Course! The timing could not have been better. While our first teacher training with Ellen had laid the foundations, I was looking to consolidate what I had learnt and to deepen my knowledge. I knew that I would get all this and much more with Neil’s course. I had been attending his classes since 2007 and had always been very impressed by his knowledge, conviction, enthusiasm, energy, creativity and profound wisdom. He brings these elements into Chi Kri, which makes it is a fantastically inspirational, empowering and creative style of yoga. Whether you are a complete beginner or a seasoned practitioner, I can help you to take your yoga practice to the next level and beyond from wherever it is today. I am always more than happy to discuss your needs, so please get in touch by phone for an informal initial chat or drop me an email. Wishing you health, love, peace, and strength. 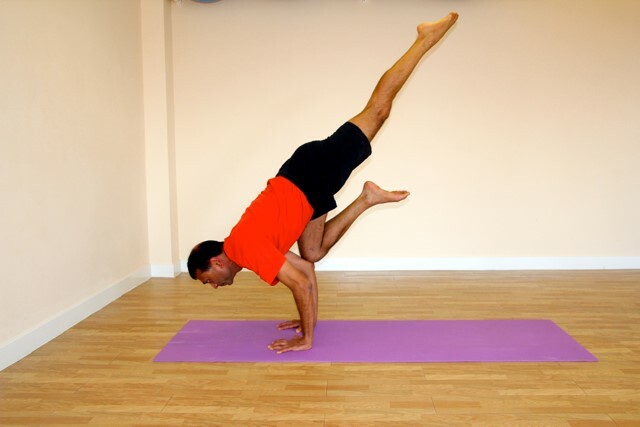 Mehul Shah is also now a Chi Kri Yoga Gold Standard teacher trainer.